March 1, 2018 6 comments on "How accurate is Zwift’s power estimate for classic trainers?" How accurate is Zwift’s power estimate for classic trainers? I began using Zwift late last year for offseason riding. In a way, it is my winter group ride replacement. I use a classic magneto trainer with a Garmin speed, heart rate and cadence sensor, which do the trick for me. Because I know the speed I’m pedalling, and since the resistance of the trainer is consistent, I can tell very easily if I’m improving. Less than one week in and I find out that the Zwift Academy has started. It looked like fun, so I joined. I believe one had to complete 2 races along with some group rides and their training workouts to graduate. The races were fun. I enjoy the challenge of competing with other riders any day of the week. but I had no way of knowing if my power was accurate. 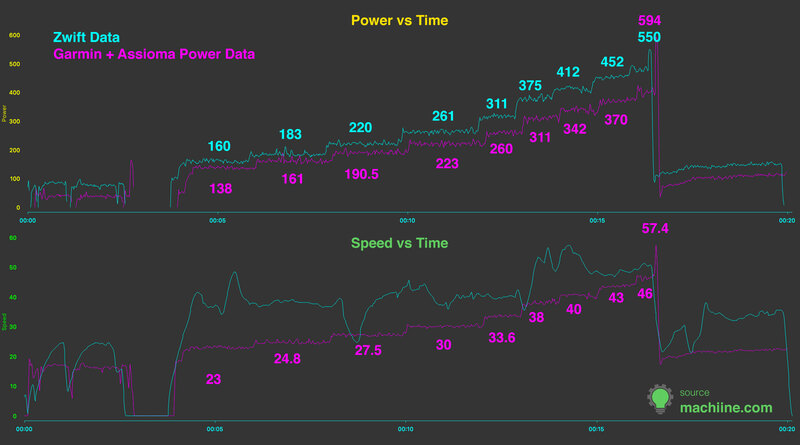 So I did the best I could to compare Zwift’s power to CycleOps power graph, which I wrote about. Still unsatisfied, I got my hands on some Favero Assioma dual pedal based power meters, and did some real tests. Here are the results. All tests were done on the CycleOps Magneto trainer. Speed was recorded using the Garmin 520 computer. Power was recorded from the Assioma Duo pedals and Zwift’s estimate. It’s pretty clear that Zwift’s estimates are off. In the lower power range zwift overestimates power by more than 30%. However, once it passes about 540 watts the pendulum swings the other way and then it begins to underestimate power by well over 22%. I really enjoy Zwift and would encourage anyone to hop on the platform, with or without a power meter. Hopefully Zwift will be able to use this data along with data posted by other users to help them improve the accuracy of their software for all riders. Those who can afford power meters and the many who are just getting into the sport. 6 Comments on "How accurate is Zwift’s power estimate for classic trainers?" Thanks for this data, Jonathan. It is clearly very helpful. I would completely agree with you that the Zwift estimation is not accurate but on a day to day basis it is consistent and will help you gauge progress. I train on a very old Computrainer. Unfortunately, I can’t sync it with Zwift due to mechanical problems with my controller. That said I can control resistance and the first thing I did was to estimate the appropriate resistance setting I needed to duplicate road resistance. I did this by testing it on a 0 grade part of the course and maintaining 90 rpm using the Wahoo speed and cadence sensors. I then set the resistance to the level that I know I would allow me to maintain the speed that I average when on the road. I used this resistance to do the FTP test on Zwift. My theory is that this will help overcome the inability of Zwift to assess drag without an accurate power meter and improve the accuracy of the FTP test. Does this make sense to you? Thanks for the article. Your conclusion confirmed what I suspected. The overestimate might just be what makes people like Zwift. It allows them to see themselves as strong riders thus stroking the ego. One thing I noticed is that before I knew I could select my trainer, (CycleOp fluid 2) my power was really low. After selecting the proper trainer power seemingly shot up. And until I get a power meter I will not really know but it really does not matter. As long as there is some semblance of consistency I can gain good training. Completely agree with you, having consistency is what matters for benchmarking training and improvement. And Zwift power offers that. I think some trainers might be overestimated, some under. But I hope that Zwift finds a way of doing some sort of spin down test that calibrates the estimated zwift power and speed with a riders gearing. One thing I like about zwift power is that it opens up the gaming experience to any rider. Cycling can be an expensive sport, but the easier it is to jump on any bike and any trainer to join zwift, I think it will attract a lot more riders to cycling. Fantastic evaluation. Thanks for spending the time on this. Hi Alex, you’re welcome. I enjoyed putting it together. Thanks for a terrific review, Simon!